Pic Talk: Mahesh kids enjoying with Mom..! Former Miss India Namrata Shirodkar is one of the supermoms from celebrity fraternity. She's had a lot of tags in life — model, Miss India, actor, star wife. But of all these roles she's played, Namrata Shirodkar says being mother to her two kids, Gautam and Sitara, is the best one yet. 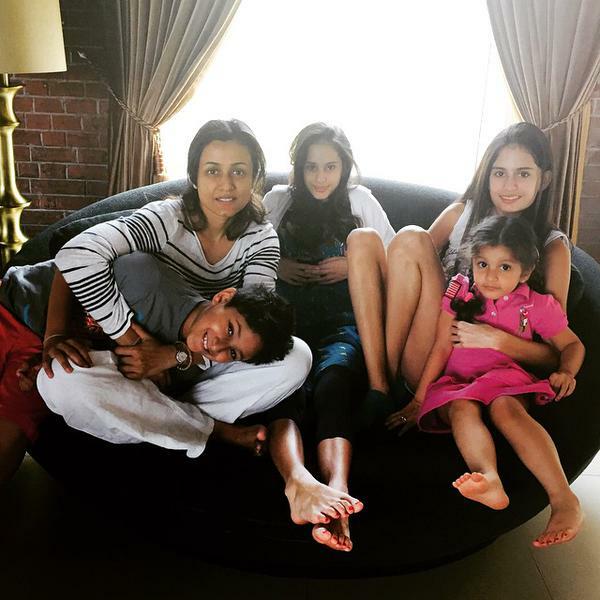 Despite her busy schedules Namrata makes sure that she spends quality time with both her kids Gautham & Sitara. Whenever time permits she will fly to abroad for vacation along with her husband and kids. Here is a latest pics of Namrata with Gautham and Sitara hanging out having fun time. Sitara looking cute in the picture and Goutham have been pampered by his mom. The 40-year-old actress married Mahesh Babu after dating for five years. The duo acted together in Telugu blockbuster film "Vamsi" in 2000.